Sukeban Games’ VA-11 Hall-A: Cyberpunk Bartending Action launched three years ago on PCs, and it appeared on the PS Vita in 2017. It is now making its way to the PlayStation 4 on May 2, 2019. 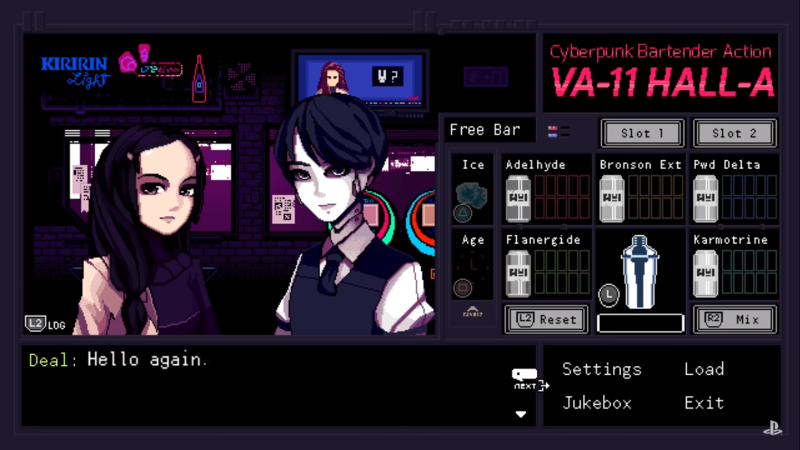 In VA-11 Hall-A, you play as Jill Stingray, an ordinary Bartender in the dystopian Glitch City. The game is set in a future where everyone is infected with nanomachines that oppress them. VA-11 Hall-A is not a typical cyberpunk game, though. Instead of toppling corrupt governments or solving murder mysteries in dark alleyways, you are just a simple bartender whose goal is to make sure everyone gets a drink. Depending on which drinks you serve the regulars and how boozed up they become, they will divulge more interesting information. This will allow you to learn about their backstories, what their day to day lives consist of, and what makes them tick. Fernando Damas, Co-Founder of Sukeban Games explained that the game’s launch on consoles was a welcome surprise, and that the team is extremely grateful for all of the support it received over the years. If you told me five years ago that the game we made for a game jam would be on consoles everywhere, I would’ve probably been annoyed at you pulling my leg. But VA-11 Hall-A is now a reality, our reality, and we will forever be thankful to everyone that has supported us all the way through the tough times and more. It was also mentioned that VA-11 Hall-A‘s protagonist’s boss, Dana Zane, predates the creation of Sukeban Games. She was the mascot for a co-founder’s blog well before the studio even made games. When the studio started making games, the blog’s mascot stayed was immortalized within VA-11 Hall-A. Will you be picking up VA-11 Hall-A when it comes to the PlayStation 4 on May 2nd? Let us know in the comments below!